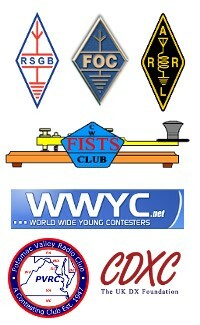 With limited space available I wanted to be able to try out SO2R contesting and also allow the 2nd station in the shack to use the HF bands at the same time as the 1st station. It struck me that as the Cobwebb is an array of dipoles that each resent 50 Ohms at resonance. After putting together a very quick NEC model of the Cobwebb I was able to verify that the mutual coupling between adjacent contest bands would be acceptably small when used with band-pass filters. Due to the way that the cobwebb feed box is arranged I decided that the original plan of feeds for 20m, 15m, 10m and then 17/12m wasn’t practical. 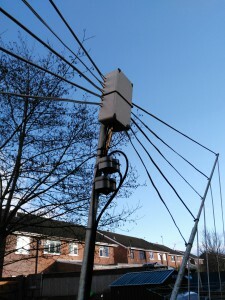 The existing feeder was used for 10/12m and the link wire to the 15m element was removed. 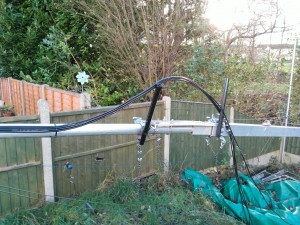 Then I removed the link wire from the 17m element to the 20m element and added another cable for the 20m band. 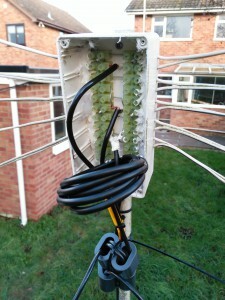 Both extra feeds use Aircell-5 coaxial cable and have a choke fitted just outside the feed box. The choke is made to the GM3SEK design but with Aircell-5 rather then RG-8mini to reduce the number of connections required. 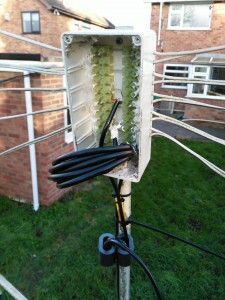 The connections were sealed up with liquid electrical tape from SOTABeams and the box lid was fitted. The next job was to fit stand-offs for the cable runs to prevent the cables from flapping against the mast and making noise in the wind. 20mm PVC conduit was used as it was hand.